she is our new women’s Ministry leader. As a life-long member of the White House Community, Amanda attended grade school through high school here in our small town. Amanda is married to Erik Anderson and they have two children. They come to us from Jesus Reigns Fellowship, where they attended for 15 years. In 1998, she graduated from Western Kentucky University with a teaching degree and came back home to teach in Sumner County. She is currently a middle school science teacher at Christian Community School, here in White House. Amanda was ordained as a minister through Ark United Christian Church, under the leadership of Bishop Doan Johnson. Through the years, she has taught Sunday School for children and adults, directed a Children’s Church program, and more recently she has ministered at some local women’s conferences. She enjoys playing the violin, spending time with her family and ministering the Word of God. Women’s Ministry is all women at Christ Worship Center united together in all that we do for service to our Lord, no matter the service or leadership. God calls each of us for a specific task to the church or our community. He may even call you to use your talents or gifts in other ways. Whatever direction you are led, Women’s Ministry collectively supports how our different callings can be united in how we run God’s church and outreach activities. We know of great ministries at work already! These women encourage others and provide a targeted ministry that God has called them for. Women’s Ministry – Amanda Anderson. Women’s Pastor – Amanda Anderson. Children’s Ministry – Connie Amons. Event Crew [Decorations/Kitchen] – Jewel Malone. Senior Luncheon – Brenda Lawrence. 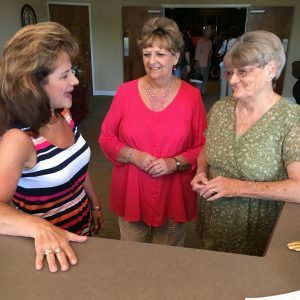 Worship Team – Wanda Hinson, April Sadler, Carol Dollar. Movie Night – Lisa Davis. Sunday Bulletin – Stacy Baughman. Church Secretary – Debi Hoffman. Board Treasure – Susie Diemer. If we’ve inadvertently left you out – keep reading! You may not realize that you can receive support, leadership, and an organized group that will benefit your outreach activities. Sisterhood and God’s loving grace are central elements to the Women’s Ministry at Christ Worship Center. Ladies – share with us the work you are doing so that more can be reached and can benefit from the work that God is calling you to do. 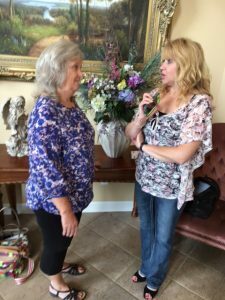 to share your ministry and get connected! All women who attend Christ Worship Center, whether involved in a specific ministry or not, are encouraged to attend the monthly meeting. We share together in our ministries, pray, and receive support in whatever we’re doing. Get connected! Third Tuesday of each month at 7:00 pm at the church.